Please read through the following content prior to submitting the application below. We urge you to consider important variables such as health, temperament, and the breeder’s policies before restricting yourself to a specific coat or eye color. Color is not a consideration for us when considering a particular pairing. Pet/Companion Contract ($1200; $600 for custodial): Click Here! General Show Contract ($1600; $800 for co-own): Click Here! Contract Overview: In addition to ‘common sense’ purchasing policies, such as providing proper veterinary care and training, we also have a few other simple expectations. If at any time owners find that they can no longer keep one of our puppies or dogs, we require that he/she is returned to us, (or that we are directly involved in the subsequent placement) in an effort to avoid having any of our dogs end up in shelters or rescues. Additionally, we require that purchasers update us at least once each year by providing information about their dog’s health and temperament. This helps us evaluate our breeding program. Please see our contract links and policies page (above) for further information. NOTE: WE DO NOT HAVE A ‘BREEDING-ONLY’ CONTRACT! If you want to ethically breed purebred dogs, you need to do something with them… not just breed them. There are enough poorly-bred animals in shelters – nobody else needs to contribute to that population. So, if you’re a ‘back-yard breeder’, a ‘puppy mill’, or someone who just ‘wants to have a litter’ for any reason other than those that comply with our ‘reputable breeder’ definition (see Purchasing Policies page), please do not inquire. If you want to produce AKC Champion-Sired puppies like ours, then you need to get your dog to the shows and finish the title. You need to study the AKC breed standard and animal structure, and learn what it means to apply those topics to pedigrees and genetics. If you’re unwilling/unable to do those things, then I’m sorry; but, we would be unwilling/unable to sell you a show puppy. Deposits: A non-refundable deposit of $100 is required to hold a place in line for a pet puppy PICK- after show prospects are selected (typically at 8 weeks of age). We take into consideration the temperament of each puppy and his/her prospective family, so the ultimate placement of puppies is at our discretion; however, we still attempt to accommodate color preferences as much as possible. Deposit holders are not required to select from those puppies offered at any given time. Future litters can always be considered; however, deposits will not be refunded. The deposit form can be downloaded, printed, and either emailed or mailed to us, along with your deposit (Paypal also available). Final pick-up balance should be paid with cash, unless other arrangements have been made. Please submit the online application questionnaire form below so that we can get an idea of what you are looking for and whether or not we can be of further assistance to you. We will get back to you as soon as possible! Do you give permission for Jaleraran Siberians to forward your inquiry (including your email address) to other reputable Siberian breeders for possible response? Please keep in mind that this is not a McDonald's Drive-Thru and you are not special ordering a puppy by color. There is a lot more to a Siberian than just his or her coat or eye color. Which age of a Siberian are you looking for? Are you looking for a specific coat color? Are you looking for a specific eye color? These are my preferences, but I would consider a healthy puppy of another color. I only want a puppy of the color combination I indicated, and I will search until I find it. 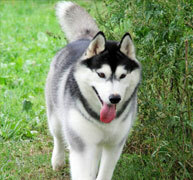 Do you currently own a Siberian Husky? 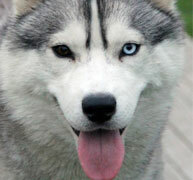 Have you owned a Siberian Husky in the past? Will you use a crate to train your puppy? How will your Siberian go outside? If you are purchasing a pet, will you agree to sign a contract stating that the dog is to be spayed/neutered and not to be used for breeding purposes? 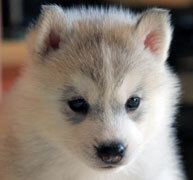 Please tell us why you want a Siberian Husky.